Many toddlers go through a “biting stage.” Toddlers bite their Mommies and Daddies, or maybe toddlers bite other children. The parents of children who are bitten become fierce defenders of their children. Their “I’ve got to protect my child” response can easily come across as “Your child is bad,” and can set off emotional waves that parents of the biter and the bitten are poorly equipped to handle. But, sometimes toddlers bite, this commonplace behavior has nothing to do with how “good” a child is, or how well he is parented. Every infant experiments with biting. Babies bite their teething toys, their mommy’s breast, their pacifier, or the fingers or shoulders of their parents. Usually, the parent’s immediate flinch or cry of surprise communicates to the child that biting hurts, and after a few experiments, the child has learned enough about biting to move on. The experiments cease. There’s nothing bad or wrong with these biting experiments: the baby is doing what he or she must do to learn. It helps the learning process if the adult responds with a loud “Ouch! Please don’t bite me,” but doesn’t blame, punish, or lecture the baby. The baby needs to experiment in order to learn, so a few painful moments will be necessary before the learning process has taken its course. Parents must guard their own safety with an infant who is exploring biting. For instance, it doesn’t make sense to put your finger in the mouth of a baby who is exploring biting, if he has teeth! One of the main reasons toddlers bite is because they are feeling afraid or frustrated. When they haven’t had their fill of close, relaxed time with their parents or caregivers, or when stress has risen in their lives, they may not express the fears or frustrations through natural outlets like crying and tantrums. To them, the situation doesn’t feel favorable for expressing lots of feelings. But the feelings rumble nevertheless, and when they become intolerable, biting can occur. Toddlers need chances to express their frustrations, fears, and other upsets on a daily basis. They want to be close to Mommy and Daddy, but mommies and daddies have to work, shop, fix meals, talk on the phone, and take care of other children. Toddlers in childcare want to be treasured by their caregivers, but caregivers have many children to consider. So tension builds, one little disappointment or lonely moment at a time. A day’s ordinary events can easily leave a toddler feeling upset and alone, although nothing an adult would consider “difficult” has happened. For instance, if a parent is gone for a night on business, a toddler doesn’t understand her absence. He feels afraid and tries to cry, hoping to heal his fears and sadness in the arms of someone who loves him and will listen. But the well-meaning caregiver believes that the toddler will feel better if he doesn’t cry, and gives him a bottle or shushes him to sleep. The next day in childcare, this toddler bites another child. He tried to release his tensions, but couldn’t. So the feelings he stuffed away jump out in the form of biting. He doesn’t know why, and he didn’t choose to bite. He was simply too full of tension to function well. Tensions involved when toddlers bite can arise from things that have recently happened. The birth of a sibling, the absence of a parent, witnessing violence on TV, a change in caregivers, or moving from one apartment to another are the kinds of things that can cause a child to bite. 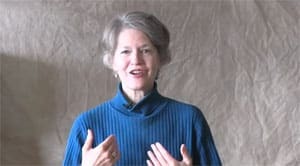 Patty Wipfler talks about children’s feelings of aggression. Sometimes, the most likely explanation for a toddlers’ bite is that it’s driven by feelings that come from events at the beginning of a child’s life, rather than by current tensions. For instance, I know several toddlers who would bite or lash out at other children when there was no unusual stress that their parents could identify. Usually, this aggression would arise when children were sitting or playing together in close quarters. When we began to try to figure out what tensions might be operating, we found that each of these children had experienced a difficult birth. Each had been born after a long labor or after being stuck in the birth canal for some time. We guessed—with young children, guessing is the best one can do—that children crowding close might trigger strong, early feelings of being trapped and in danger. Sometimes, toddlers bite out of frustration. To be a toddler is to see a vast number of interesting things people do, and to think, “I want to do that!” The toddler doesn’t know that he doesn’t yet have the power or coordination to fully succeed. It is a hopeful and a frustrating time of life. When a toddler’s tantrums—his natural, healthy, and tension-relieving response to frustration—aren’t allowed, a child’s frustration can build until he can’t stand to be close to other children. He bites or lashes out, because the buildup of frustration inside him has had no permissible outlet. 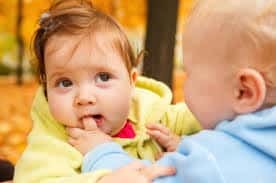 Guessing why toddlers bite can be helpful in predicting when this behavior will arise, so that you can be close at hand to intervene to help the child and protect other children. But to help a child, you don’t need to understand the source of the tensions. Whether you have thought of a likely cause or not, your helpful actions will be the same. Biting doesn’t release a child’s inner tension. A child feels much worse after he’s bitten someone, even if he appears to be indifferent. Hurting someone adds to his load of upset, and the guilt he feels makes him look like he doesn’t care. But inside, he’s more frightened than before. When a child has bitten someone, get close. Tell him gently that you’re sorry you didn’t get there in time to keep things safe. Then, move so that you can look into his eyes, and ask him if he can tell you how he feels. You won’t usually get words of explanation, but you will get a child who feels so badly that he can’t look at you, and can’t connect. He will usually begin to writhe and squirm. If you keep gently trying to make eye contact, and tell him you want to be with him right now, a child will often be able to move into releasing feelings through crying or a tantrum. Sometimes a child will begin to laugh, rather than cry or storm, as he tries to wiggle away. That is a good sign. Laughter is often the first step in the tension release process. All the child needs to keep releasing the tension that caused him to bite is your kindness, and your attempt to connect. You don’t need to be the child’s parent to be the one to help. Any nearby, caring, patient adult is a good person to intervene. A child over the top with tension needs a listener, any listener. If the listener isn’t his parent, he is likely to cry about wanting his parent. Those may be the feelings at the root of his biting behavior. There two strategies that are proactive and begin having a good effect quickly. They are Special Time and Staylistening. The first step to helping a child who bites is to strengthen his ability to feel your attention and love. Special Time is an ideal tool for this step. Set a length of time, anywhere from three to twenty minutes, tell him how long it will be, set a timer if you have one, and then get close. Offer warmth, eye contact, and enthusiasm, and play the way the child wants to play. If he’s playing in a manner that excludes you, keep offering gentle touch and eye contact. If he finds a way to laugh with you—without you tickling him—try to keep the laughter going, because laughter releases tension and helps children feel safe and understood. When the time is over, let him know that you enjoyed playing with him, and that there will be another Special Time soon. Special Time, done daily or several times in a week, will encourage a child to show you his feelings as they arise. He may start crying when you leave, or have a tantrum instead of sulking when he doesn’t get an extra cookie. Children who have begun to bite are signaling that they have big feelings that need to be heard. These feelings are carried to the surface by small pretexts such as not wanting to get into the car seat, not wanting to undress for a bath, or not being able to give up playing in order to go to day care. The child wants and needs someone to lovingly listen while he releases his feelings through crying or tantrums. Staylistening gives the child this chance. When the parent or caregiver notices that feelings are about to erupt, the child will benefit if he moves close, drops other expectations for a time, and listens with warmth. Children know exactly how to unload tension. Parents and caregivers have the opportunity to revamp their responses, so that crying and tantrums can do the wonderful but time-consuming job of dissolving the feelings that are at the root of biting and other difficult behavior. Used consistently, Special Time and Staylistening will provide a release valve for the tensions that cause a child to bite. It may take awhile—they usually have a full storehouse of tension built up by the time toddlers bite. But if you listen until a child is done crying, you will him relax, and play more freely. He will show you more of the emotional storms he hopes you’ll help him with, rather than tightening up until he lashes out. Sometimes, a parent will be snuggling and playing affectionately with their delighted toddler. when their child bites them out of the blue. It’s a shock, and feels like an insult! After it happens a second time, parents become wary of playing at close range. They can’t understand why their own child bites them during the sweetest of playtimes. Why does this happen? When you have been bitten, it’s smart to react with as little fluster as possible. Hold your child close, and say something like, “Honey, I can’t let you bite me. Tell me what’s on your mind.” Offer eye contact, and stay very close. The feel of your attention and your willingness to listen will help your child progress from biting but having no feelings about it—fears make most people, big and small, numb to their feelings—to feeling upset, panicked, or frustrated. Stay close and supportive. Your attention helps the child focus on the feelings he needs to express and heal. Your attention is a balm that, when he’s finished, he will fold deeply into his heart. Once your child has bitten you in the midst of affectionate play, be on the lookout for him to lunge for you again when you play with warmth and closeness. If you can catch a child who is ready to bite just before he has gotten to you, and put your hand on his forehead, you’ll be able to keep yourself safe and he’ll be able to notice the tensions that drive him to bite. Gently hold him, inches away from the bite he feels driven to take, and tell him, “I’m not going to let you bite me, dear,” in a tone that lets him know you’re ready to help him. Offer your support and attention, and don’t let your child change the subject. He will either laugh hard and release tension safely that way, or begin to cry hard because he finally has the safety he needs. Your support helps him feel the fear that’s bothering him. A child can’t help that his feelings are packed in so tightly that biting occurs. He has tried to cry, and tried to tantrum, but has not yet gotten the support he needs to release feelings of fear or frustration. You can help, whether you’re a parent, a caregiver, a grandparent, or a friend. Every child will move away from biting, as soon as the release of his pent-up feelings allows him to relax and feel safe. Children who bite are good children in need of a good cry, in the arms of a caring adult. Read How I Helped My Son Stop Biting for more ideas on reaching a child that’s biting. Helping Children with AggressionHandling Aggression: Setting Limits with the Vigorous SnuggleThank You for Stopping the HittingWhen Your Child Screams, "I Hate You!"